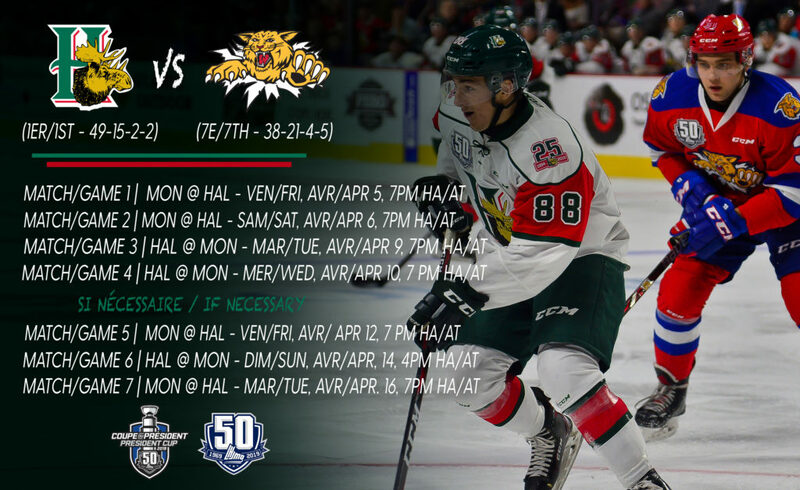 The two oldest Maritime-based franchises in the league will add another chapter to their long-standing feud when the Halifax Mooseheads host the Moncton Wildcats to begin their President Cup Quarter-Final series this Friday. The Mooseheads, after clinching first place in the Maritimes Division during the regular season, faced the Quebec Remparts in round one. 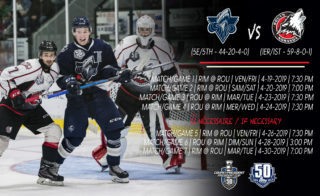 Despite a 35-point differential between the two clubs during the 2018-19 campaign, the Moose battled from series deficits of 2-0 and 3-2 to take Games 6 and 7 at home and punch its ticket to the second round for the second straight year. 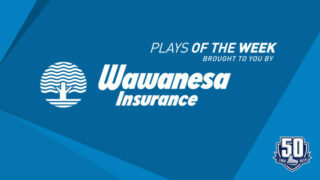 Last year, the club was swept in four straight games at the hands of the Charlottetown Islanders in the “Q” Quarter-Finals. 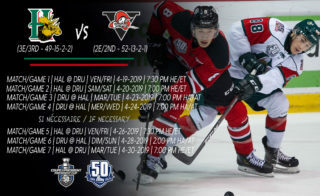 The Mooseheads will be looking to advance to the league Semi-Finals for the first time since 2014 and are hunting for its second President Cup title to go with the one earned in 2013, they same year they captured its first Memorial Cup Championship. For the Wildcats, who entered the postseason as the seventh seed in the Eastern Conference, everything old was new again in round one. For the second consecutive year, the team found itself facing elimination entering Game 6 against the Drakkar in Baie-Comeau. 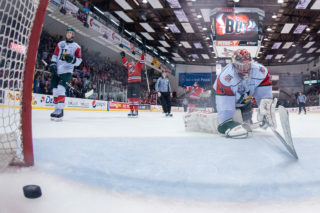 Much like they did in 2018 against Rimouski, the Cats rebounded to win first Game 6, then Game 7 in enemy territory to upset the second-seeded Drakkar. 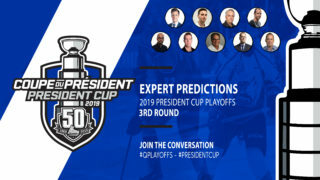 The Wildcats are aiming to reach round three for the first time since 2016 and, subsequently, claim its first President Cup championship since 2010. 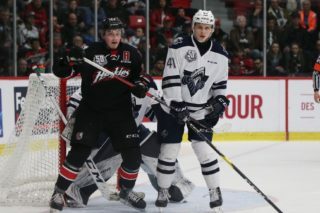 Over the 24 seasons both franchises have been members of the QMJHL, they have clashed in the playoffs four previous times. The Wildcats took the first of these encounters back in 2006, a five game Quarter-Final series that eventually led to Moncton’s first league title. The Cats also captured the most recent series between the two squads, a seven-game thriller in the 2015 Quarter-Finals. For their part, the Mooseheads needed double overtime in Game 7 before eliminating the Wildcats in the first round of the 2007 playoffs. The Moose also required OT the last time they emerged victorious in postseason competition against the Cats. That occurred in game four of their first-round encounter during the 2012 playoffs. One of the main catalysts behind the Mooseheads’ first round rally was winger Raphael Lavoie, who enters the Quarter-Final round as the league leader in goals with seven while sitting tied for first in points with 13. Also chipping in were wingers Arnaud Durandeau and Maxim Trepanier with six points each. Overage center Keith Getson produced five points over the final two games of the series while Jared McIsaac, Justin Barron and Jake Ryczek each registered five points from the blueline. Goaltender Alexis Gravel finished the series with a 2.72 GAA and .908 save percentage. The Wildcats earned a Quarter-Final berth much the same way they produced wins during the regular season; key offensive threats and very capable netminding. Jeremy McKenna and Mika Cyr both found themselves in the top five in points at the conclusion of round one with 11 and 10, respectively. Veteran defenseman Gabriel Sylvestre stepped up in the absence of key rearguards Jordan Spence and Aleksi Anttalainen to record five points and a team-leading +6 rating against Baie-Comeau. In nets, Francis Leclerc was rock solid for much of the series against his former Drakkar teammates, posting a 2.54 GAA to go along with a league leading .932 save percentage. The Mooseheads won the season series by a wide margin, taking seven of nine from the Wildcats overall. Their last matchup occurred in Halifax on March 14th, when Benoit Olivier-Groulx’s pair of third period goals would prove to be the difference in a 5-3 Moose triumph. The last victory for the Wildcats in the season series occurred a few days earlier on March 9th. On that night, winger Jacob Hudson led the way with a goal and an assist in Moncton’s 3-2 win at the Avenir Center. One of the key themes in this series could be health. Star forward Jakob Pelletier returned to the Wildcats lineup for the final two games of their series with Baie-Comeau, playing in a limited role due to a lower body injury. Additionally, the aforementioned Spence remains an unknown after leaving due to injury early in round one. As for the Mooseheads, who battled injury on a constant basis during the regular season, forward Groulx remains sidelined after being diagnosed with mononucleosis just prior to the start of the postseason. Two franchises with a long history, previous playoff success, large arenas and fanbases and a healthy dislike for one another. As is typically the case, the latest postseason edition of the Moose/Cats rivalry is sure to feature something for everyone!